Sorry I've been MIA for a while - I've been blogging all over the place to spread the word about my latest Ellora's Cave book, Hollywood Spank, and right now I'm editing two books at once. On the same day I got back edits for Taste of Candy, a short ebook with The Wild Rose Press, and edits for my upcoming book Chastity Belt with Ellora's Cave. 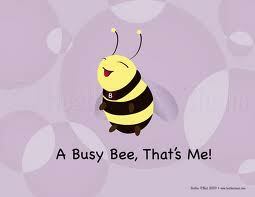 I'm not complaining - this is my idea of the perfect problem to have :) I'm just a busy bee now, that's all. I also have an idea for a full length paranormal romance that I'd like to flesh out into an outline and then take a couple months off to write it. My husband pointed out that taking a couple months off writing to write a book doesn't make sense. To me it does, though, because I've never written paranormal before, so I'm viewing it as an experiment that might not pan out and lead to a contract. I better get going on those edits! Makes sense to me. I always when heading in a new direction do things like reading in the genre and jotting notes of what to do and what not to do. Good revising.